Can ‘ape-like’ actually be ‘human-like’? Fig. 1 from Schwartz (2012). “Bivariate plot of ln M1 emergence age in months (y) versus ln cranial capacity in cubic centimeters (x) for a sample of anthropoids.” The hominins and humans are the open shapes, to which I’ve visually fitted the red line. It’s a very high correlation (r=0.98). This means that armed with simply an animal’s cranial capacity, which is fairly easy to estimate given complete enough fossils, one can estimate with a bit of confidence its likely age range for M1 emergence. With brain sizes between apes’ and ours, fossil hominins can be estimated to have erupted their M1s at younger ages than us. Many subsequent studies of tooth formation, based on the microscopic remnants of tooth development, have supported these inferences. So presumably, faster, ape-like dental development could be extrapolated to mean ape-like body growth rates and other aspects of life history as well. But although this is a tight relationship, there are deviations. 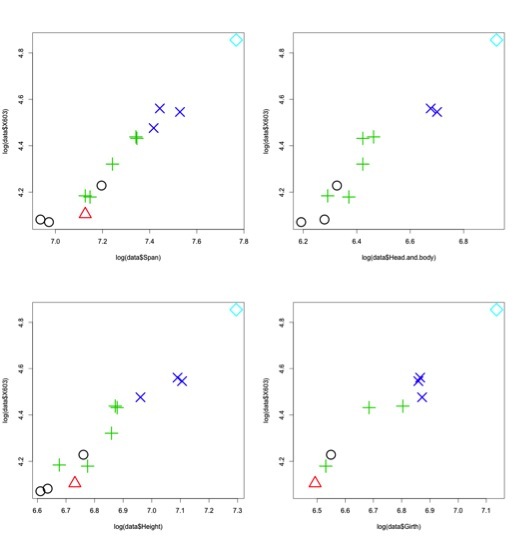 As Schwartz notes in the article, and others have noted before, high correlations found when examining large interspecific groups (e.g., primates as a whole) often break down when the focus is on smaller groups of more closely related species (e.g., just apes). Based on the relationship figured above, humans are expected to erupt M1 around 7 years of age, but nearly all humans erupt M1 closer to 6 years (hence the open diamond for humans is below the regression line). What hominins appear to share in common with humans is a younger age at M1 eruption than expected for primates of their brain sizes (the red line I’ve added to the figure). 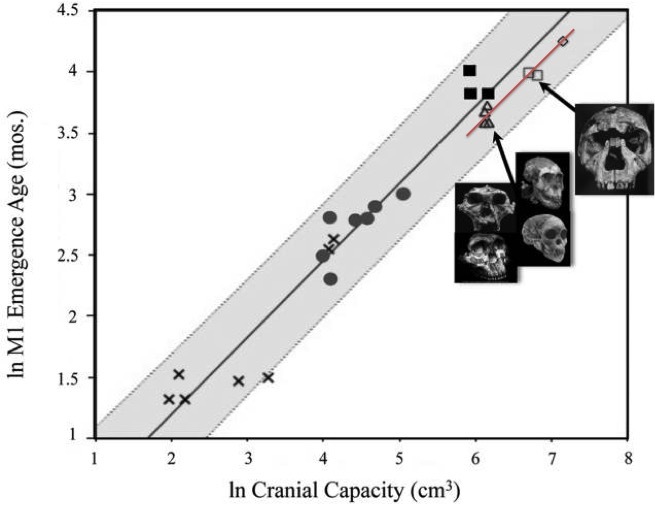 Hominins’ faster dental development and eruption may be ape-like in absolute terms, but eruption ages may be human-like when their brain size is taken to account. As with many life history variables, the significance of this similarity (if anything) is difficult to ascertain. Mandible as a measure of overall body size? I’m currently in Kent, United Kingdom, examining African ape jaws to follow up on my dissertation research comparing jaw growth in humans and Australopithecus robustus (having a tough time writing this stuff up for journal publication, but hopefully things’ll start coming out soon). One thing I’d assumed (with evidence, of course), was that aspects of mandibular size could serve as a proxy for body size, to make inferences about body growth. Now that I’m in Kent, I’m hoping to get good evidence of this in the non-human African apes. The Powell Cotton Museum in Kent has an awesome collection of chimpanzees and gorillas (see the Human Origins Database by Adam Gordon and Bernard Wood for more information on these samples). This collection was accumulated during a time last century when explorers would go out and collect specimens from the wild, usually by finding and killing them. Now, when Major Percy Powell-Cotton was out doing this, he or some of his assistants actually collected measurements on some of the corpses – arm span, height, head+body length, and chest girth. This means we can see which aspects of the mandible correlate with body size, which is important since the fossil record usually affords us mandibles more than any other part of the skeleton. Length of the back of the ramus to the P4, plotted against measures of body size. Colors/shapes represent 1 of 5 dental eruption age groups. There aren’t body size measurements for all individuals, and I’ve been biasing my own sampling toward subadults. So I only have body size data for up to 15 of the 70+ gorillas I’ve been able to look at. From this meager sample, though, it looks like many aspects of mandible size may well end up correlating with aspects of body size. For instance, the distance from the back of the mandibular ramus to the front of the P4 is highly correlated with all 4 of Powell-Cotton’s bodily measures (right). Will an expanded sample size uphold these high correlations? Will we see major differences between the sexes, or between different age groups? Will chimpanzees follow the same rules as gorillas? Hopefully I’ll be able to let you know by the time I’m done working in the museum! Recent UM Ph.D. Kevin Langergraber and others (including UM primatologist John Mitani; 2010) recently reported on a high correlation between genetic relatedness and ‘cultural’ behavioral repertoire in wild chimpanzees. Chimpanzees, and other animals, have been observed to display behaviors that appear ‘cultural,’ since the behaviors are variously a) learned from other individuals, b) specific to certain chimp populations, and/or c) not recognizably adaptive. 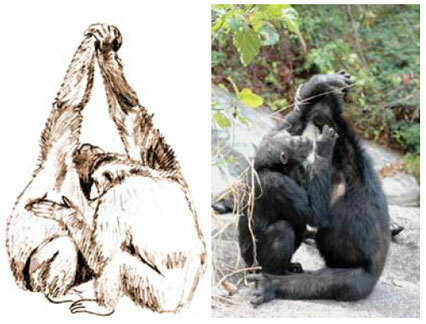 Such behavioral variants include, for example, how hands are clasped during grooming (photo from Whiten, 2005), or whether/how insects are acquired. Researchers have debated whether these behavioral variants actually represent culture, in the sense that humans have culture. This itself is tough because anthropologists have had a helluva time defining what ‘culture’ is simply for humans, let alone animals. I’m a bit anthropocentric myself, and I’m wont to view culture as something uniquely human, the adaptation (or set of adaptations) that has essentially shaped our evolution for over a million (2 million?) years. Anyway, back to Pan, Langergraber and colleagues set out to test whether genetic variation may help explain some of the behavioral variation between different chimp populations. Lo and behold! there was a significant correlation between groups’ genetic dissimilarity and behavioral dissimilarity. This isn’t at all to say the authors have found the genetic basis for cultural behaviors, but rather that some genetic variation may underlie some behavioral variation we see in chimpanzees. Indeed, the authors note that the mtDNA used in the study doesn’t ‘code for’ any of the putatively cultural behaviors; it’s a proxy for genetic relatedness. However, there was no clear pattern of which types of behaviors (e.g. grooming- vs. feeding-related) correlate with genetic relatedness. The results are a bit tough to interpret. The authors state that the finding of a correlation does not mean that many chimp behaviors analyzed are not cultural. But it doesn’t necessarily mean that the behaviors are cultural, either. This gets really tricky for a number of reasons. First, identifying “the” or “a” genetic basis for phenotypes is difficult, and it’s especially difficult for complex phenotypes like behaviors (in general, if you ever hear about a “gene for” some behavior, immediately disbelieve it). The analysis uses an allegedly neutral DNA marker, that admittedly does not ‘code for’ any of the behaviors in question. All the DNA can do here is attempt to indicate relatedness among groups. To say that “genetic differences cannot be excluded as playing a major role” in patterning behavioral variation (p. 7), basically means that some unexamined genetic region may be patterned among populations the same way as the mtDNA marker, and might be responsible for specific, fine-tuned, non-adaptive aspects of their behavior. The authors discount the possibility of the link being due to kin teaching behaviors to kin, but I would suppose a higher resolution (like looking at relatedness and behavior between individuals rather than groups) would put that matter to rest. Next, how much of a correlation is biologically (and here culturally?) meaningful? In various permutations of their analysis, the correlations between the behavioral and genetic dissimilarity matrices ranged from r = 0.37 – 0.52, most of which were significant. “Significant” here means that the correlation coefficients, r, are different enough from zero – there isn’t no relationship between the variables (I mean to say the double negative). Put another way, we can square the r coefficients to get the ‘amount of variance explained’: 13.7 – 27.0% of the behavioral dissimilarity can be ‘explained’ by genetic dissimilarity. What if the correlation coefficients had been higher – would this be better evidence for some genetic basis for chimp behavioral variants? I love correlation as much as the next guy, but aside from significance level, variation in linearity is not always completely understandable. So, regardless of the results of the analysis, do apes (or other non-human animals) have culture? An interesting conundrum is that when people describe the subtle variants of behavior as cultural, they’re assuming the variation itself is non-adaptive, while the grand behavior itself purportedly is. Can things that are readily adaptive (ecological explanation) not also be cultural? Moreover, how widespread in a population must a behavioral variant be to be cultural? How many variants on a theme are permissible within a population? Questions like these are why I tend to shy away from the topic of culture, in humans and animals. Whiten A. 2005. The second inheritance system of chimpanzees and humans. Nature 437: 52-55.